Following in the footsteps of Robert Burns on the Burns Trail, Alloway. Come join me on a virtual tour around Ayrshire, and let’s follow in the footsteps of Robert Burns, meeting some of his famous characters along the way. Pottering around Ayrshire we’d passed several signs for Soutar Johnnie’s Cottage. Intrigued we decided to check it out. If you’re familiar with the Burns poem ‘Tam O’Shanter’, you’ll recognise Soutar Johnnie as Tam’s drinking crony. I’ve loved the tale of Tam O’Shanter since I was a wee bairn (little child). I always preferred stories about creepy and magical beasties, over those about adventurous, posh kids drinking lashings of ginger beer. As a student I was taught Scottish Literature by a fabulous, eccentric called Professor Jack. In lectures, he’d recite Tam O’Shanter from memory as he leapt around the room, arms flailing. He was a joy to watch and always had me enthralled. Souter Johnnie’s Cottage is located in Kirkoswald, where Rabbie attended the village school. With thatched cottages and an old ruined kirk and kirkyard the village has a timeless, old world feel. Souter Johnnie clearly wasn’t expecting us, as we arrived to find his house closed. Thankfully, it was only closed temporarily for renovations. Undeterred, we decided to check out the old ruined kirk and kirkyard instead. “Maybe Souter Johnnie’s in here?”, I suggested. I was right – not only was he in there, he was alongside his literary buddies Tam O’Shanter and Kirkton Jean. We found Robert Burns’ grandparents, and his old school master buried there too. I didn’t know the characters in the poem were based on real people, so I was delighted by this new discovery. Apparently, the real Tam O’Shanter and Souter Johnnie loved nothing better than visiting the town of Ayr on market day. They were known to have a fair skinful (drinking binge), just like their literary immortalisations. After Kirkoswald, we headed to Alloway where Burns was born in 1759. Before exploring the Burns Trail in the village it was time to eat. We found a little tea room (aptly named Poet’s Corner) and grabbed an al fresco lunch. With snow falling in other parts of Scotland, we felt smug basking in April sunshine. Fed and caffeine levels topped up, it was time to explore Alloway’s Burns trail. Our first stop was the bard’s birthplace. Although the village was busy, the outside of Burns Cottage was delightfully people free. It was an unexpected surprise to be able to snap the famous cottage without moaning about people wandering into shot. The Wee White Dug piped up that Burns wasn’t the only famous, handsome lad who hailed from Ayrshire. He too was an Ayrshire laddie. We were surprised to learn, that after appearing on some Visit Scotland billboards in London he considered himself to be as famous as Robert Burns. After snapping Burns Cottage, we meadered along Poet’s Path. The path features Tam O’Shanter weather vanes and statues inspired by other Burns works – it’s great fun. We weren’t long on the path when the boy came face to face with ‘the’ moose. He was not amused. He puffed up his chest and gave the gargantuan moose his most fearsome (yappy) terrier bark. The moose didn’t flinch. The Wee White Dug decided it probably hadn’t seen him, so he crept by with the stealth of a ninja, muttering about calling pest control. After our encounter with mega-moose we headed to Alloway Auld Kirk. This is where Tam O’Shanter watched the witches dance as Auld Nick played the fiddle. It’s also where you’ll find the parents of Robert Burns buried. It’s such an atmospheric place, and it really brings the poem to life. I could almost hear Tam, lost in the moment crying out “weel done, Cutty-sark” before immediately regretting his outburst. Our next stop was the Brig o’ Doon. Brig is the Scots word for bridge, and the River Doon is the river that flows under this famous literary bridge. After angering the witches by interrupting their hellish ceilidh, the terrified Tam flees on horseback towards the keystane (keystone) on the brig – the witches hot on his heels. Witches can’t cross flowing water, so if Tam reached the keystane he’d be safe. He was lucky that night – he escaped the otherworldly beings pursuing him. His trusty mare Meg did too, but she wasn’t quite as lucky as Tam. Although she escaped with her life, poor Meg had her tail was torn off by a witch. The boy practiced some fast running on the Brig o’ Doon, and was confident he’d have reached the keystane with his tail intact. We didn’t for a second believe he could outrun a horse, so we ignored his outlandish boasts. Our last Burns inspired visit of the day was to the Burns National Monument & Memorial Gardens. The gardens were a riot of cheery Spring daffodils – very pretty. We ended our Burns inspired literary tour with a stroll amongst the daffies. Ayrshire is a beautiful region with lots to see and do. If you’ve enjoyed this blog, you may like this other Ayrshire inspired post too. It’s only fitting that I end with a quote from the great man himself. Previous Glen Lyon – home of the Fortingall Yew. Next Start spreading the news……. Ha ha, yes this was an April trip. Wonderful stories, a freat read, keep them coming, from an old Scot living in Canada. Tam O’Shanter was always one of my late fathers favorites! Once again, I so enjoyed, not just the travelogue, but trip down memory lane! And I thoroughly agree with Casper on his considered fame! can’t cross flowing water, I will keep that in my mind next time one of them will be chasing me. Ha ha it’s very useful information. All you need is a bridge and running water and they can’t chase you any further. Brilliant blog! Loved it and all the Scottish words. Coming from Texas, I’ve had to learn a lot of those! And I love the Brig A Doon bridge. 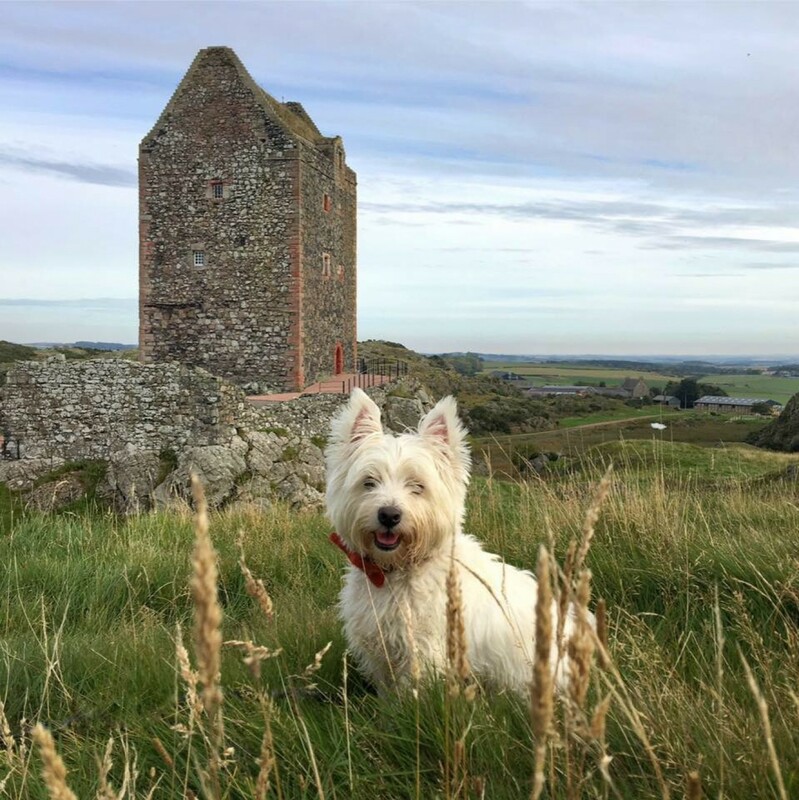 My 4th Texas Miz Mike mystery-romance-suspense is set here in Scotland and I just had to call it “Bridge to Brigadoon!” Love your wee white dug, too! He’s a ham and loves to pose for pictures!